The US premeditated and planned attack on Yemen today is not justified by any legal or military rationale whatsoever. On October 7th, the US issued travel warnings to Americans traveling or visiting/residing in Yemen [travel.state.gov/content/passports/en/country/yemen.html (just a day before the #Yemen_Great_Hall_Massacre in Sana’a by Saudi double tap air raids in which 150 mourners were murdered and another more than 600 injured – an unlikely coincidence?). There was no imminent danger or preceding attack on any Americans nor was any travel to Yemen permitted by anyone by the so called Saudi-led coalition of Aggression on Yemen. Obviously, something else n the drawing board triggered issuing the alarm. On October 4, three US warships were sent he Red Sea Bab Al-Mandab Area right after UAE Twist warship was defensively hit by Yemen Naval Forces, it was clear the US was pursuing a more aggressive stance in the illegal war on Yemen waged by the so called “Saudi-led” Coalition of Aggression on Yemen. On Saturday and yesterday, the US Defense Dept alleged that Houthis were launching missiles against the three US warships off the Yemeni coast. All missed their targets and landed in the water. Not once in these reports did the US DoD state that Yemeni Navy or forces were the source. Of course, Saudi media was quick to blame “Houthis and Saleh militias”. 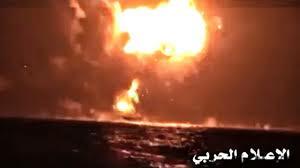 The Yemeni Navy and military spokesmen categorically denied any attacks against any ships after the attack on the UAE http://edition.cnn.com/2015/04/20/politics/iran-united-states-warships-monitoring/. This serious development in US military engagement in the Coalition of Aggression against Yemen raises many questions and risks complicating an already drastic human tragedy unfolding in Yemen. The “bogus” unconfirmed missile attacks, (assuming they did occur, at all) could just as well be launched by either US forces stationed in Al-Anad military base or other “coalition” allies launching from areas in Coalition controlled territory in Aden, and other areas. It is noteworthy to point out that all Yemeni rocket attacks on Coalition Warships were always direct and successful hits and not “misses” as these were said to be by US Department of Defense spokesmen. If we look at mainstream media coverage of this flagrant aggression by the U, all were acting as mouthpieces for the US Navy and Department of Defense and assumed that the US DoD reports of the “bogus” attacks were gospel truths and insisted that the US aggression on Yemen was right, called for and justified. Not one shred of evidence was presented by the media or the US forces. Most Yemenis and independent observers are of the opinion that the US is trying to bail out its miserable Saudi partner in the Coalition from all the public outrage regionally and internationally against the bloodbath the Saudis have perpetrated against Yemeni civilians from the start of its sadistic bombing of Yemen since March 26, 2015. On the other hand, this drastic and risky escalation may be to dilute increased opposition to US role in Coalition of aggression against Yemen, both in Congress and the US press and the obvious war crimes that have clearly been evident, especially as US weapons are thee main killing tools in the aggression. I am sure that attempts to include a *new” Iranian presence adds more smoke to the cover up especially as the Iranian naval presence in the Arabian Sea was there since the beginning days of the aggression (http://edition.cnn.com/2015/04/20/politics/iran-united-states-warships-monitoring/)Is this the review that the US National Security Council intended (but has yet to begin) on the US role in the Illegal and criminal aggression by the KSA led Coalition against Yemen? I imagine Saudi Arabia is holding the checklist of the “Review” Process and of course, the checkbook. This entry was posted in Gulf Cooperation Council, Hizb-Allah, Human Rights, Saudi Interference, Saudi-led Coalition Against Yemen, US Aggression on Yemen, US Involvement in Yemen War, Yemen and tagged #Yemen_Great_Hall_Massacre, Abdul-Malik Al-Houthi, Ali Abdullah Saleh, Arabian Peninsula, Common Sense, Gulf Cooperation Council, Hassan Al-Haifi, Saudi aggression, Saudi and American Intervention in Yemen, UAE Warship Twist, US Navy attacks Yemen, Yemen. Bookmark the permalink.